People often ask me for in-progress photos of their projects. I usually cannot do this because of the time involved. 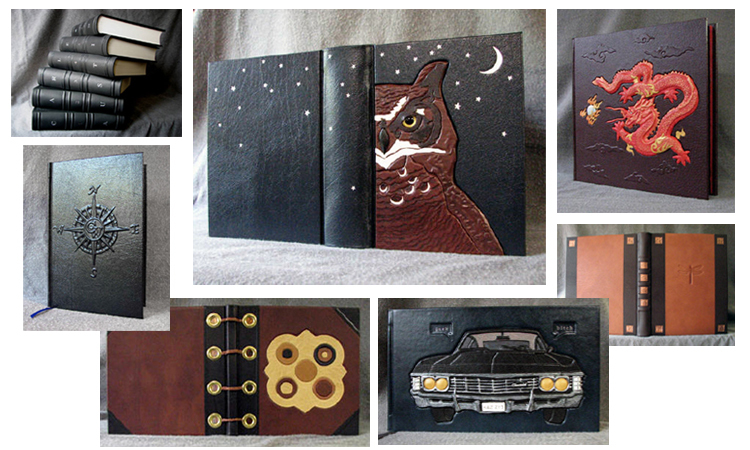 However, I did take in-progress photos for this Supernatural fan fiction binding project. 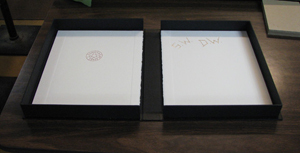 This project included a custom leather cover with raised and stamped elements as well as a custom clamshell box to house the finished book. 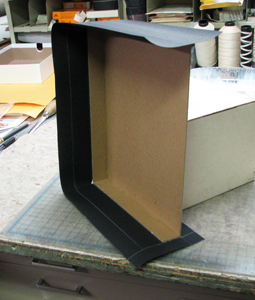 Read on to see the many steps involved in binding the book and building the clamshell box. You can read about this book and the idea behind the cover design on the pop culture gallery page of this site: click here. 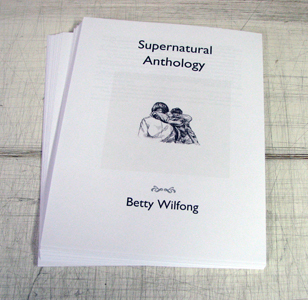 These are the pages as I received them from the printer. Usually, I make books with blank pages. In the case of books with blank pages, I hand-sew the pages in folded sections called "signatures" and this allows the book to lay open completely flat. I cannot do signature sewing with individual pages because there are no folds to sew through. 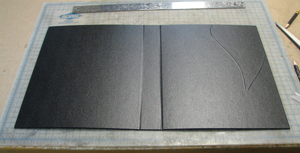 For individual pages like this project, they are oversewn on an oversewing machine. This is not as elegant as hand-sewing, but it is a very durable form of sewing. 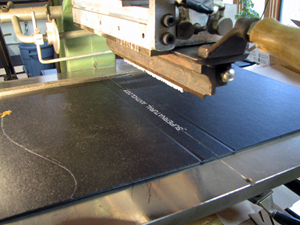 The above photo shows the pages being sewn on an oversewing machine. This is a 1930's machine. 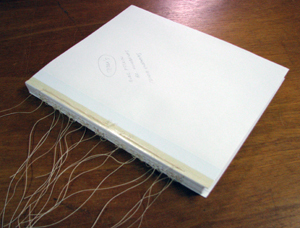 It sews about a 1/8" thickness of the book at a time. I put a "pad" of paper into the machine and hit the foot pedal and that pad is sewn. The next pad goes in and that pad is sewn to the pad before it and so on. When the book block comes out of the sewing machine, it looks like this. At this point, all of the long threads are extra, but if you started pulling on the thread, the whole thing would unravel. The long sheets on the top and bottom are endpapers. 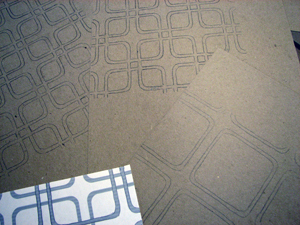 These are oversewing endpapers made to be used with an oversewing machine. See the yellowish edge of the endpaper? That is like an old-fashioned envelope; it has water-activated adhesives. This adhesives strip is painted with water with a brush and then folded back over the sewing and clamped, thus "pinning" the sewing underneath and making it impossible to unravel the thread. Here is a closeup of the pages sewn on the oversewing machine. And here is how it looks after the blade comes down and trims the pages. 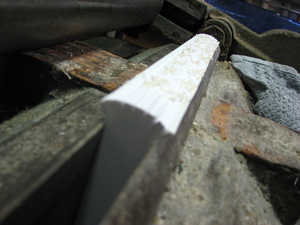 After the pages have been trimmed (the extra-long strings were trimmed from the spine of the book before the pages were trimmed), the book is clamped, spine-up, in a rounding/backing clamp. You can see that there is just a little bit of the spine sticking up above the edge of the clamp. Before I put the book into this clamp, I "rounded" the spine slightly (you can see above that it's rounded; not flat) by hand with a rounding hammer (not pictured; I can't do it and take a photo of it at the same time). 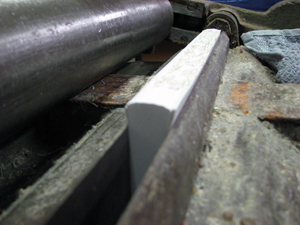 The edges of the spine are flared out over the edges of the clamp. This creates "ears" on the book and is called "rounding the spine". Once the spine has been rounded (flared), it's time to add the headbands and backing cloth. You can see the decorative headbands, cut to fit the width of the spine, above. Headbands are the decorative pieces of woven cloth at the top and bottom of the spine. 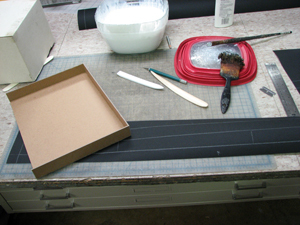 The headbands have been attached and now glue (archival poly vinyl acetate) is brushed onto the spine. "Backing cloth" is glued very securely to the spine. Here you can see the backing cloth glued to the spine of the book. 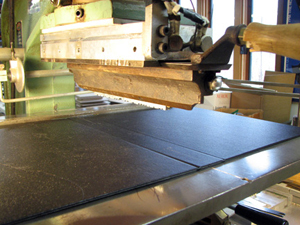 Backing cloth is a step that is often skipped by factory-scale binderies. It reinforces the hinge area (where the cover and spine meet); the area of the book that gets the most wear and tear. I believe backing cloth is really essential. 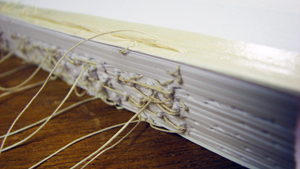 Many books fall apart over time when the backing cloth is not used. In those cases, the endpapers are the only thing holding a book into the cover. The backing cloth provides extra reinforcement for this part of the book that is repeatedly flexed over time. Now that the "book block" (everything that is not the cover) is done, it's time to move on to the cover. On this book, I first spent about an hour (or a bit more) getting the design set up in Photoshop. This entailed taking a small sample of the pattern and creating a layered image, pasting the smaller design onto a "new sheet" in Photoshop the size of the cover until the pattern covered the cover. I had to make sure the pattern was the size I wanted it to be. I had to think ahead and make sure the lettering I wanted to add to the cover later would fit inside the squares. I resized this about three times in Photoshop before I had it the way I wanted it. I printed out that Photoshop creation (that's the piece of paper you see above). 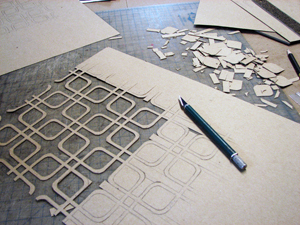 I use carbon paper - yes, carbon paper - to hand-copy/trace the design from the printout onto thin tag board. It's getting harder to find carbon paper these days! Here is the design transferred onto the tag board using the carbon paper. Carpal tunnel time! :) The design is then cut, by hand, with an x-Acto knife, out of the thin tag board. It look me most of a day to cut the pieces for the cover of this book. 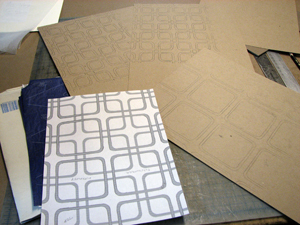 Once the design is completely cut out (this design involved two layers...the one you see above, then a separate layer of individual squares), the tag board is glued down to the binder's board that will make up the cover which has already been cut, using the paper cutter, to fit the size of the pages. Next comes the leather. This is the back-side of a piece of burgundy pigskin leather. 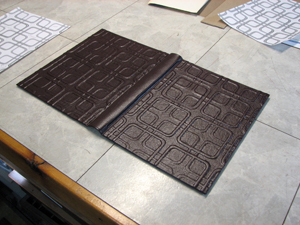 I need to figure out where to place the boards on the leather so that the cover will fit the book block properly. I cut a strip of paper that is the width of the spine of the book (the width of the book block). 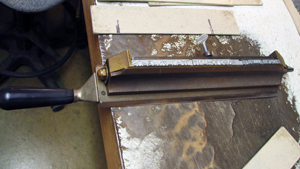 That strip is used to measure the gap in the middle of the tool used above which is called a "back gauge". If I use the correct thickness of binder's board, this tool gives me the correct space I need for the spine of the book, between the cover boards. I then mark the cover placement on the back-side of the leather and trim the extra from the edges with a ruler and a razor blade. 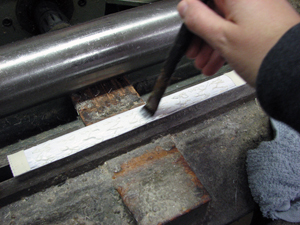 Once the leather is cut to fit the cover, the cover boards are coated with glue using a brush. 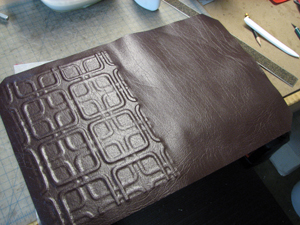 The cover is then pressed in a large hydraulic press with foam over it to help the leather start to take the shape of the raised design underneath. Unfortunately, this process does NOT give me a crisp result; it just gets the process started with even pressure over the whole cover (the cover is put into the press one side at a time). 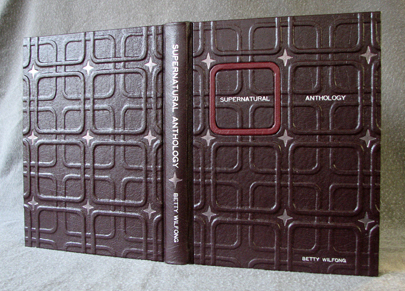 Above, you can see how the cover looks when it comes out of the press. I then start to go over (and over and over) the raised design with a rigid, pointed bone folder (you can see the white bone folder made out of Teflon in the upper right of the photo above...I also use bone folders made out of actual bone; usually cow bone). You can see that the left side of the cover in the above photo looks a bit more crisp than the design closest to the spine; I have gone over the left side with a bone folder several times in this photo, but not the entire cover. This process might take an hour as I go over the raised design again and again with the bone folder, making sure I get ALL of the edges of the design (this is a larger and more complex design with lots of edges...as well as being a front and back cover design, so this took awhile). I press and rub the leather down into the raised design with the bone folder as the layer of glue between the cover board and the leather starts to dry. After the design has been gone over with a bone folder for about an hour, you end up with a very crisp result. 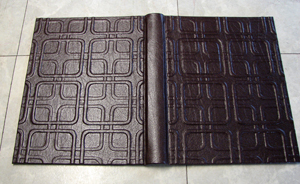 The edges of the leather are turned in around the edges of the binder's board cover. Not pictured here is the separate square I cut from matte board that will be covered, individually, with red pigskin leather and, ultimately, permanently attached to the cover in a slightly recessed area. Above, you can see the turned-in edges. There is a strip of paper lining the spine. Special cuts are made at all four corners to give the leather a "mitered" corner which means there won't be several bulky layers of leather at the corners. There will only be one layer and this makes the corners nice and flat on the inside....the leather meets exactly at the corners instead of overlapping. This cut is done by hand using a razor blade and a ruler before brushing glue onto the edges and wrapping them around the cover boards, pressing them down with a bone folder on the inside. 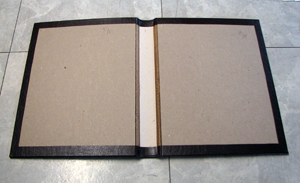 Once the leather cover dries completely overnight (it is dried in place around the pages and pressed under weight as it dries...sandwhiched between foam to further encourage the leather to take the shape of the raised and recessed areas on the cover), the cover is removed from the pages and must be laid flat to add the foil decorations and lettering. 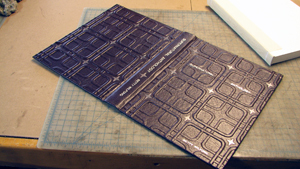 The above photo shows the four-pointed retro star decoration being added to the cover using hot foil stamping. The star is in the shape of a metal "die"; a raised design on a metal block. This block has been mounted in a "pallet", clamped tightly, and then put into a larger clamp in a hot foil stamping machine. The whole thing is heated, in the machine, to 250 degrees. The two gold stamping machines I use range in age from 1923 to the 1950's. A thin layer of hot foil stamping foil (which is colored aluminum with a microscopically thin heat-sensitive adhesive on the back) is placed on top of the cover (for the stars on this cover I used a pewter-colored foil), but before that, I have to line up, by eye, where I want to stamp the star in the center of each four-cornered design. This is tricky. It is one of the fastest ways to screw up a cover and if you stamp something where you don't want it, you CANNOT fix it or re-do it; you have to re-make the entire cover. The more times you have to stamp a cover, the more chances you have to screw it up, so individually stamping this star as many times as I had to gave me plenty of chances to screw it up. Screwing up just one means I can't use the cover that I already put so much time into creating. The heated die is brought down on top of the foil under pressure (also done by feel; I don't want to press it too deep and cut through the leather and if I press too lightly, the foil design will not transfer completely and my star will have holes in it) and as soon as it touches the foil with pressure, it leaves the design, in foil, on the cover. I had to put these stars on the front and back covers one at a time, lining it up by eye each time. Next comes the lettering. The lettering is added using moveable metal type. 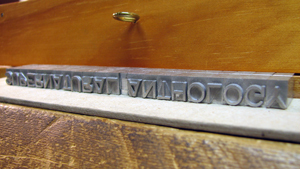 Above, you can see some of the drawers of moveable metal type. Each letter is raised on its own block of metal (magnesium, in this case, though type can also be made from lead or brass). 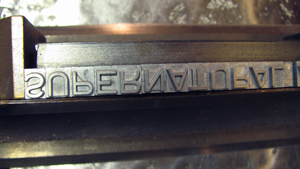 The lettering has to be set up upside-down or backwards (a mirror image) in order for it to stamp correctly on the cover. The above photo shows the entire line of spine lettering clamped into a long spine chase. You might notice that there is a space in the line where I want to add the retro star to divide the title and the author's name. This cannot all be done in one step because the lettering is a different size than the die I need to use to add the star. I added the star later, in a separate stamping process, using a slightly smaller gold stamping machine. 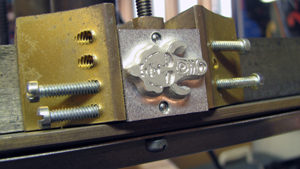 The above photo shows the lettering in the clamp, in the stamping machine, heating up to the correct temperature for stamping. Same as the four-pointed star, the spine lettering has to be lined up on the spine by eye; centered left-to-right and top-to-bottom, then, the hot lettering is brought down onto the spine with a layer of silver foil between the hot lettering and the cover leather. The lettering is then transferred to the cover. The above photo shows the result of the stamping. 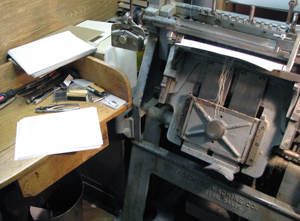 Foil stamping is one of the slowest and most nerve-wracking parts of bookbinding. If you spell something wrong, you have to start over and re-make the cover. If you stamp it in the wrong place, you have to start over. I think I spent about two or three hours stamping this cover; slowly, so as not to make any mistakes. Once the foil stamping is done, it's time to permanently attach the pages to the "book block". 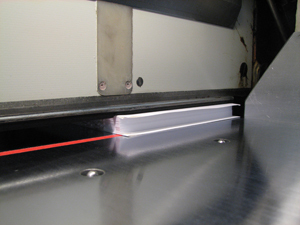 Glue is applied in a line along either side of that paper strip lining the spine on the inside of the cover. The pages are positioned the way I want them (they have to be straight in the cover) and the book is clamped in a machine called a "joint creaser". This does not attach the cover to the pages. It "pre-glues" it so that the pages are centered in the cover. I do not have a photo of the next step (I could not do it and photograph it at the same time), but next the endpapers are glued to the inside of the front and back covers. To do this, archival white glue (more poly vinyl acetate) that has been thinned down with water to be about the consistency of milk is brushed, by hand, onto the back-side of the endpapers. I also glue down the flap of cloth you saw applied to the spine much earlier in the process; the "backing cloth". This creates a cloth-reinforced hinge where the cover hinges open at the spine. If a book has backing cloth, you can usually see a slightly-raised shadow of the cloth under the endpapers. The backing cloth makes the book last longer. 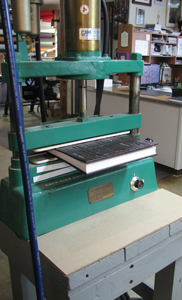 Once the glue is brushed onto the back-side of the endpapers and backing cloth, the book goes back into the hydraulic press. Because the cover has a raised design (it's uneven; not flat), I have to press it with foam on either side. This even pressure glues the endpapers down completely flat (as long as I don't use too much glue which might leave glue blobs under the paper!). I have to brush a very thin layer of glue onto the endpapers and I can't miss a spot. 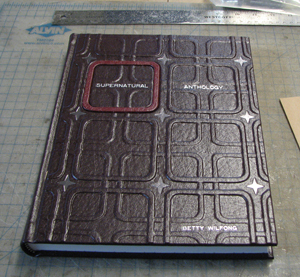 The book will have to dry overnight, but once the endpapers and backing cloth are glued down, the book is finished. 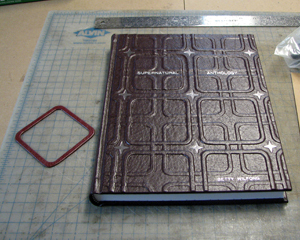 On this book, the last step was to add the single red leather square to the front cover. This square was cut from matte board and covered with red pigskin leather (it's trickly to neatly cover a small, thin piece like this). The square is then permanently-attached to the cover (sorry, I'm not telling you how I do that) in the slightly-recessed area that I carved out of the cover board before the leather was put on the cover. At this point, the book is completely done. 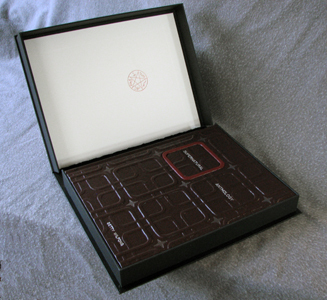 But the project isn't done...because the book needs a custom-made clamshell box to protect it. 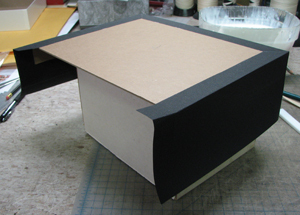 Clamshell boxes are great protection for a book. They are much better than a slipcase (because the book doesn't rub against anything as it is taken in and out of the box as it does with a slipcase). 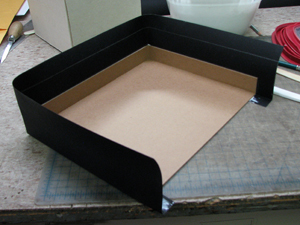 Making a clamshell box usually takes longer than making the book itself. There is no machine to make a box. It's all made by hand. First, I measure the book. There are specific points on the book that I need to measure and I will NEVER take an order for a box unless I have the book itself in front of me. I wil not make a box from measurements taken by a customer. I must have the book in front of me. 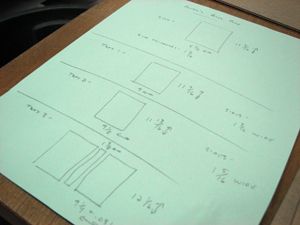 The above photo is the sheet of calculations I need to make in order to know what I size I need to cut all of the pieces. 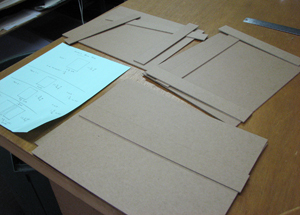 A clamshell box involves cutting eleven pieces for each box. They have to be precise, or they won't fit together when done. 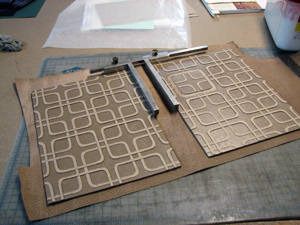 I use the large paper cutter that you saw trimming the edges of the book earlier to cut down the larger sheets of binder's board (the same board used to make the covers of hardcover books). But many of the measurements on a box are smaller than the back guide of the cutter will go (the strips that make up the sides of the box are too narrow), so I have to use another piece of board BEHIND the one I want to cut...and still get the correct size. 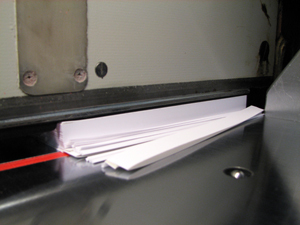 Luckily, the paper cutter is very precise and can cut things down to the width of a human hair. The above photo shows all of the pieces I had to cut for the box. Two trays and a cover. The above photo shows the two trays that I have glued together. One is the tray the book sits in, the other goes over it to form the cover. These have been edge-glued by hand and then they have to dry for a little while. 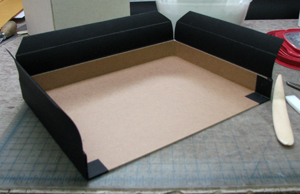 To cover the edges of the box trays, I cut long strips of black linen book cloth (in this case). In the above photo, you can see the tray sitting on this strip. You can also see the marks in silver pencil on the back-side of the cloth so I know where to place the tray when I glue it down. These marks also help me make the cuts necessary to cover the inner and outer corners later. Using the frazzled-looking brush you see in the above photo and the white glue (more archival poly vinyl acetate) in the container, I brush the glue in an even layer onto the outer edges of the box tray. I lay the box on the cloth strip, using the marks I made a guide, and then rub down the cloth onto the board with a bone folder. I do this for all three sides until the outer edge is completely covered with cloth. 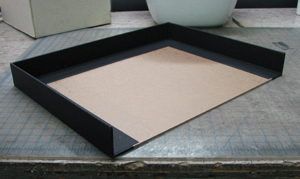 The above photo shows the box tray with coth covering the outer edges. I have to turn in the cloth on the bottom of each tray. I put the tray upside-down on a small box, cut the corners to fit, then brush glue onto each edge and glue it down flat one edge at a time. I rub the cloth with a bone folder to glue it down smoothly and completely. The above photos shows what the underside of each tray looks like with the edges turned in. Next, I turn the tray right-side up. I make a bunch of exact cuts in the cloth in order to get the cloth to turn in, cleanly, around the box edges. The outer corner cuts are different from the inner corner cuts. 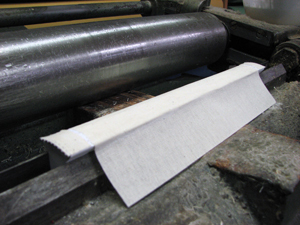 The above photo shows the cloth cut and ready to be turned in. This cutting is done by hand with a ruler and an x-Acto knife. I brush glue onto each "flap" one at a time and turn it in, gluing it down to the tray. I start with the flaps at the front of the tray (above). I rub each of these down with a bone folder to make sure it makes contact everywhere and does not have any air bubbles or glue lumps. I have to brush glue onto the cloth very evenly. The long flaps are glued down last. 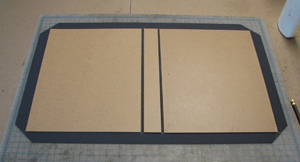 The above photo shows the first tray with all of the flaps turned in and glued down and all of the tray edges covered. I then repeat the entire process on the second tray. Once the trays are covered, it's time to make the cover for the box. 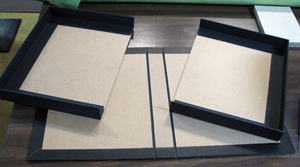 The box cover consists of three pieces: a front, back, and spine made from binder's board. This box has a raised element on the front cover (the raise amulet cord). I usually only do raised designs with real leather because book cloth barely stretches at all and often cannot take the shape of an underlying raised design. However, in this case, the very thin thread I was planning to use to create the raised design was so thin that it worked with book cloth. The book cloth used for the cover of this box is a cloth with an imitation leather Morocco grain. I wanted to make the string a bit stiff first, so I immersed it in thin glue, pressed out the excess, and let it dry. I glued the string to the box cover in the pattern I wanted. I had to make sure to measure the gap at the bottom of the string so that the amulet die (the gold foil design) that I would add later would fit perfectly in the gap between the strings. I cannot die stamp on anything that is not a perfectly flat surface, so there had to be a flat place between the strings to allow for the stamping. 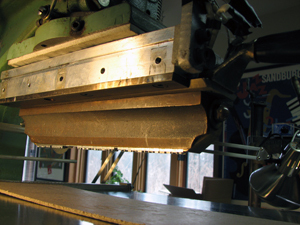 Glue is brushed onto the cover boards and the boards are pressed in the hydraulic clamp. 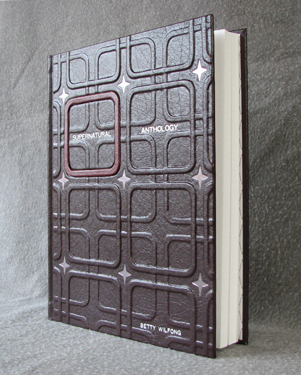 For the flat parts of the cover (back cover and spine), the pressing gives me a flat, finished result. But for the raised string on the front cover, the cover has to be pressed with foam and gone over repeatedly with a bone folder as the glue dries to coax the cloth into taking the shape of the string underneath it. Once the large, flat areas are glued down, glue is brushed along each edge and the edges are turned in around the cover boards. The inside of the cover with the turn-ins can be see above. Now that the cover for the clamshell box has been made, it's time to put the foil lettering and decoration on it, similar to what was done for the book cover. The above photo shows the metal die of the amulet image heating up in the smaller foil stamping machine (clamped so it cannot move). 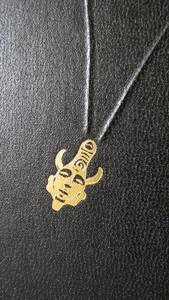 The die is heated to 250 degrees and pressed onto the surface of the cover using gold-colored foil. I have to line this up by eye to fall right in the open space between the raised strings on the cover. 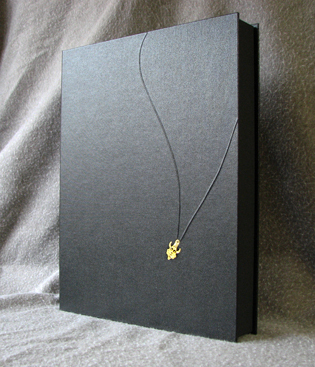 The above photo shows the result of the amulet die stamped in gold on the box cover. Next comes the lettering on the spine of the box. 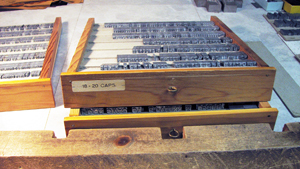 It is set up, letter-by-letter using moveable metal type. I did not use the lettering that I set up for the book spine because the lettering on the box spine needed to be a bit larger. Therefore, I had to use an entirely different set of letters (same font, different size). The above photo shows the lettering set up and ready to go into the clamp for heating. 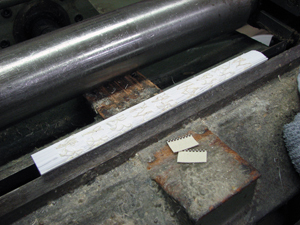 The above photo shows the box cover, laid out flat beneath the stamping machinery, with the spine lettering ready to stamp. You can see the faint lines I drew on the spine with a silver pencil (they wipe off later) to help me center the lettering. I measured with a ruler to make those faint marks. In the above photo, the lettering has been stamped on the box spine with silver foil. 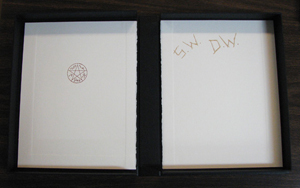 Not shown is the additional step taken to stamp the four-pointed star at the top and bottom of the box spine in pewter foil. That was done one star at a time using the smaller foil stamping machine. At this point, all three pieces of the box have been individually finished. Now that the box cover has been stamped with lettering and decoration, I can assemble the pieces. 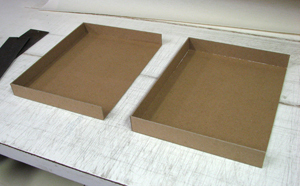 I brush thicker glue onto the underside of each tray and line it up perfectly with the cover. I then stack as much weight as possible inside and on top of each tray (I use old hardcover books, old magazines, even flat weights from an old free weight set) and let that sit overnight to dry. The next day, the weights are removed, and the box is close to being done; everything glued in the correct place. I still have to line the box. 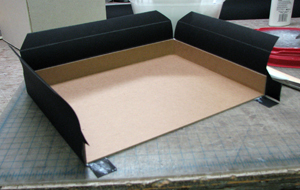 To line the box, I cut a strip of black linen cloth (same cloth used to cover the edges of the trays) and two pieces of acid-free Arches cover which is a thick, archival paper. I like to leave the natural deckled edge of the paper on one side because that's often as visual sign of high-quality paper that's not completely machine-made. The paper lining of this box is stamped with decoration. 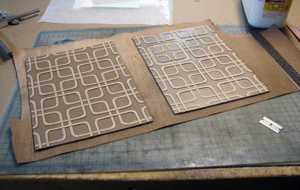 The stamping foil I use is formulated to work with book cloth and book leather. It adheres best to those materials. I CAN stamp on paper with it, but it is not as permanent as if the design were stamped on book cloth or book leather. The inside of the box will not see much wear and tear, so I decided to stamp a few designs on the paper. The above photo shows the metal dies used to stamp these designs. 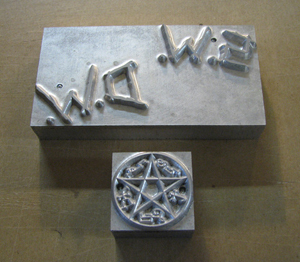 This is the same sort of thing that was used to stamp the amulet and the four-pointed star on the book and box covers. Dies are priced based on size. The large one here might cost $130 to have made...the smaller one might be more like $85. I mail black and white artwork to a die-making company in Owosso, Michigan and they turn that artwork into a raised design (mirror image so that it stamps correctly) on a metal block. 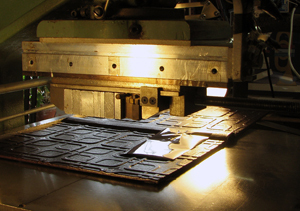 The dies are put into the foil stamping machinery and heated to 250 degrees (or a bit higher). They are pressed onto the paper with a foil color (in this case, the devil's trap is done in red metallic foil) or a pigment (the large die was done in a non-metallic tan stamping pigment). I brush the back of the black cloth strip with glue and carefully rub it down over the exposed binder's board of the spine inside the box to cover it. A bone folder is used to make sure the cloth lining the spine is completely flat and makes contact everywhere. I brush the back of each piece of paper with glue and position it in the center of each tray before rubbing it down with a bone folder to make sure the paper lining is perfectly flat.